AS-ReHeater heat exchanger units : ASIO, spol. s r.o. AS-ReHeater units are special heat exchanger units intended for wastewater heat recovery without the necessity to treat the wastewater stream (e.g. by filtration). Our heat recovery exchangers (AS-ReHeater S and D) are used in both public utilities and industrial applications, particularly in large facilities, such as food-processing, textile and technological plants, laundries, distilleries, canteens, bath houses, wellness centres, waterparks and also large-scale sewer systems and systems with industrial wastewater. • bath houses, swimming pools, wellness centres, waterparks, etc. • cost savings – from 30% to 60% in costs spent for water heating. 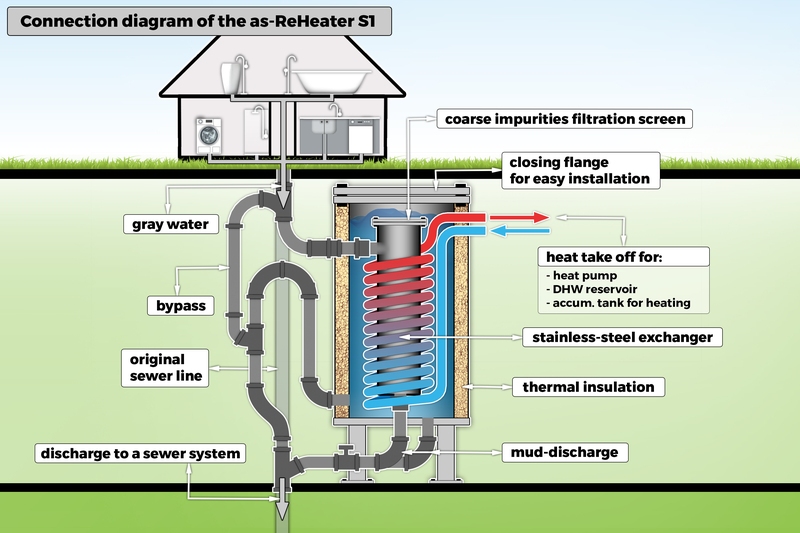 AS-ReHeater is heat recovery equipment. 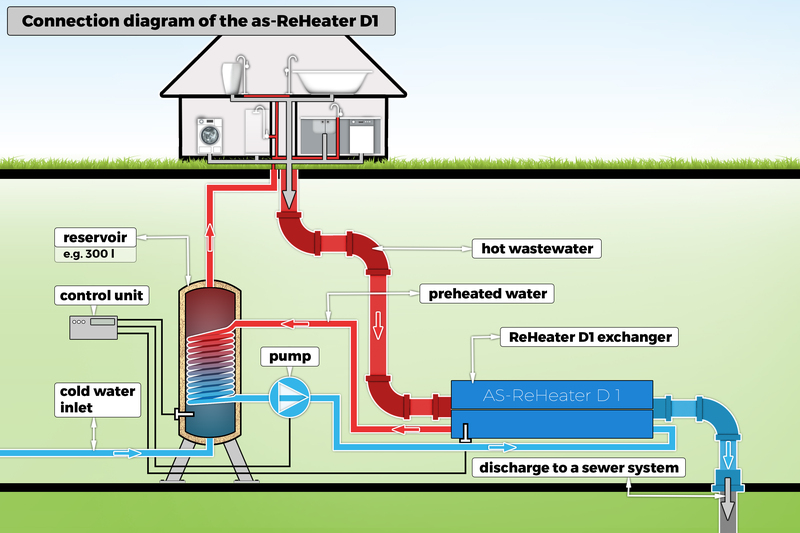 The principle of heat recovery from wastewater is logical and simple. Warm water leaving the premises to a sewer without any further utilisation transfers its heat energy to cold water preheating it thus for its further use. Understandably, this results in significant savings in heating costs of warm water in various applications. Therefore, the basic recovery principle is to gain heat energy from wastewater. The use of the AS-ReHeater D and AS-ReHeater S units is individual and it is handled according to concrete requirements. Their use depends on the connections system, space availability, and flow-rate continuity. The equipment is manufactured in a basic type range for flow rates starting at 0.2 litres per second (AS-SPRCHA, under-shower exchangers) up to the level of 8 litres per second (AS-ReHeater D and AS-ReHeater S units), so that there is a variety of possibilities of choosing exchanger by the wastewater flow rate (in seconds). In other cases (over 40 m3 per day) that cannot be involved in the mass production, the exchangers are designed individually – in both size and output – directly for concrete applications. By their design, AS-ReHeater units are manufactured to be protected against fouling and mechanical impurities are disposed as easy as possible over the exchanger to a sewer system. This minimises reductions in the efficiency of exchangers and the intervals between inspections can be extended. The exchangers are made of stainless-steel sheets (2 to 3 mm thick) or, as the case may be, of stainless-steel corrugated pipes (AISI 304 or AISI 316 Class). The heat exchangers install as the first are in the service for 15 years and their service life is estimated up to 30 to 35 years. The unique design of the units is based on the principle that wastewater entering the exchanger needs no further modification, which makes the whole recovery process significantly cheaper. In this way, it is possible to reduce the original water-heating costs by 20 to 60%. Naturally, these savings differ; they are logically influenced by wastewater quantities and temperatures. The references from already installed projects point to a very short return on investment. The return on capital costs allotted to a project ranges from one to three years. Especially short returns on investment are noted in large applications with a two-shift (or even continuous) operation. A large majority of industrial plants discharges wastewater at the cost of heat energy losses. In such cases, wastewater is discharged directly to sewer systems or it must be even after-cooled. While at the beginning, water must be heated for the purposes of the relevant process, the energy potential input ends finally in a sewer system. However, this energy potential can be, at least partially, recovered and returned to the process. On the one hand, wastewater is cooled down as required by sewer regulations, and on the other hand, a part of the energy can be returned back for process water heating. In addition, there are many processes creating waste heat and this heat can be returned to the production process, e.g. for the DHW (domestic hot water) production, process water production or heating purposes. By the use of heat pumps, the waste heat potential can be upgraded to a higher level by more than 300% (from 1 kW of waste heat we can obtain more than 3 kW of heat energy).